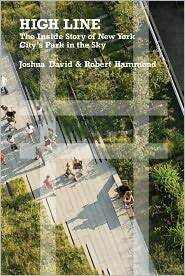 I’ve been a Friend of the High Line for several years and received an invitation to the party for the new book about the High Line written by the two guys who made it all happen, Joshua David and Robert Hammond. The book is High Line: The Inside Story of New York’s Park in the Sky. It was a lovely evening, so I headed over with my friend Sandy around 6:30pm. We’d been having a run of especially warm weather for mid-October and it was a beautiful evening. The quality of the light as the sun went down was extraordinary–kind of a peachy yellow. We walked south on the High Line to 16th St. where the party was held and we could see that beautiful view of the harbor that you get as you approach the Chelsea Passage with the streaky sunset behind it. The area was roped off, but my name was on a list so we went in and had some of the hors d’oeuvres that were being passed around and I bought a copy of the new High Line book and had it signed for my husband, who couldn’t make it. We walked around for a while, enjoying what’s probably one of the last few days of summer temperatures, and then walked north for a while into the new part of the park that stretches up to 30th St. Even this first year, the trees there have grown so large that it’s like walking through a narrow wooded path . The landscape design continues to develop and enchant. The narrative part of the book is in the form of a conversation between Hammond and David, tracing the inception of the idea to the reality of thousands of people wandering, eating, sleeping, jogging, and sunning themselves. There are a huge number of photographs, many of which I’ve never seen before, like the one that shows the “cowboys” that were hired to ride in front of the trains when they were at ground level on 11th Ave. to warn away pedestrians. In such a contentious city, where every project is hotly debated and so many never come to fruition, the High Line is literally, a breath of fresh air.